What’s left in your refrigerator this week? Any remaining assorted veggies, pieces of cheese waiting to be used up? You can easily utilize a few of these remaining complementary ingredients from your refrigerator at weeks end. Blended together with a few eggs, some half and half, then poured into a ready- made pie crust, voila, there you have it, a delicious no-waste-meatless meal in less than an hour. From my end of the week refrigerator today, a simple, Tomato, kale, cheese, tart. Preheat oven to 350 degrees. Prepare pie crust according to package directions. In a large bowl beat together the eggs with the half and half, sprinkle in the nutmeg, salt, and pepper, stir, then add in the cooked kale and cheeses, blending well. Pour mixture into the pie shell. Arrange the tomato slices decoratively into the mixture. Place tart pan onto a baking sheet baking for around thirty to thirty five minutes, or longer, depending on ingredient combination, until the egg mixture is fully set and cooked. Serve hot or at room temperature. 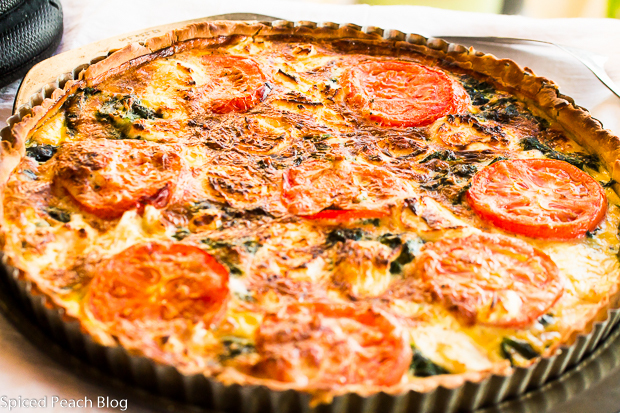 This entry was posted in Veggies and tagged no-waste-meatless meal in less than an hour, tomato kale cheese tart, using up ingredients, What's left in your refrigerator this week combine ingredients and prepare an easy tart. Bookmark the permalink. Post a comment or leave a trackback: Trackback URL. I love using leftovers and repurposing them into something delicious. This looks wonderful, Peggy. Enjoy the weekend. Hi Kelly, thanks so much. Since our IACP webinar a couple months back on the food waste problem in our country, I have been making every effort to be more purposeful in my purchases and uses of food. I think the key is as you aptly indicated: repurposing into something delicious- for this is what all of us need to be inspired by, and simple ideas for preparations. That looks delish! Now that we are eating really healthy and cooking more my fridge is loaded with stuff like this to use. Phil recently posted…Come hang with Burt Reynolds at Joe’s Bar NYC! Hi Phil, so great to see you! The tart is easy and a good example on how to use up the foods already in ones fridg. You can even bake it in a round pie dish. Great job on your healthy eating efforts too! Hi Peggy, love the fact that you are not wasting a thing, I am trying to be so much better about it, seems to be so hard, I always over buy or over make. This tart is beautiful and full of all my favorites. I always try to have some pie dough or puff pastry available for dishes like this. Hi Cheri, thanks much. I love the focus theme on preventing so much food waste this year. Sharing the delicious foods does seem a good way to begin with oneself in the effort as well as to hopefully inspire others. I know what you mean on the food purchase dilemma, I’ve been working on that as well. Thanks for stopping by. 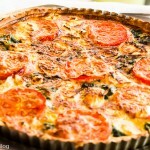 Dear Peggy, what a beautiful quiche for dinner and all in the spirit of “loving your leftovers” – no doubt we will have a lot of fun cooking our way through more of Hugh´s recipe ideas….your version with healthy kale, tomatoes and cheese sounds absolutely fabulous and delicious and just right for all those ingredients lingering in the fridge and waiting to be turned into one crowd-pleasing treat such as your quiche! 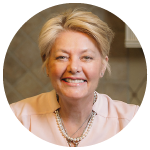 Hi Andrea, yes it is rather a spirit of loving your leftovers, or, also after an IACP webinar a few months back listening to the numbers on the volumes of food waste in this country, it was disturbing enough to at least be cognizant on doing the best I can.